Like a storm cloud roiling in the distance, the specter of electric cars looms large on the horizon. The pace of change is quickening; with each passing month, it seems yet another major manufacturer is announcing its intention to go all-in on electrons and add to the coming biblical flood of battery-powered vehicles. There will be no Noah, no gas-powered ark saving the V-8s two by two by two. We’re in for it, man. But for now, in this antediluvian era of internal combustion, it’s still hard for most people to grasp the seismic changes ahead. Blame the high price point of early adoption, or range anxiety, or capitalism, or the incessant drama surrounding a certain EV company and its Twitter-happy CEO, or humanity’s stubborn belief that the waves won't really come for us. But EVs are coming—and the 2018 Chevrolet Bolt is an appropriately-named flash of lightning ahead of the storm. What sets the $36,000 Bolt apart from its fellow pre-emptive strikes (yes, including the still-too-expensive Tesla Model 3) is that it really is an electric car for the masses. It's a high-riding hatchback that packs a 240-mile range into the kind of unremarkable package that’s simultaneously familiar, affordable, and eminently practical to the average new car buyer. 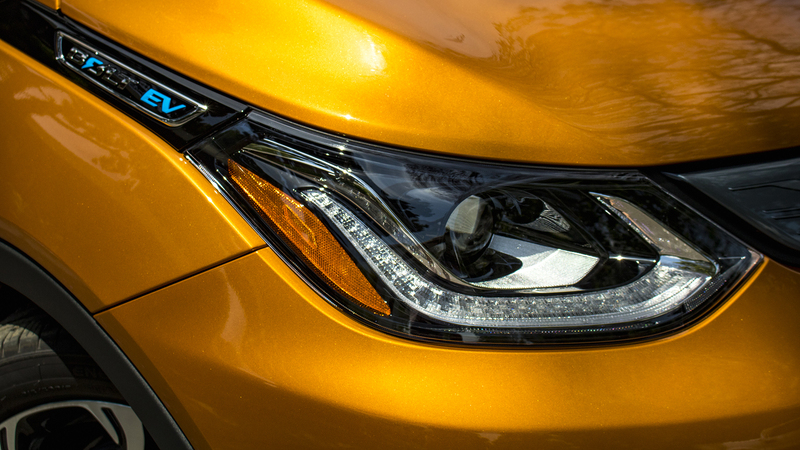 If that sounds like a passive-aggressive poke at General Motors, it’s not. Credit where credit is due: Elon Musk did a lot of the heavy lifting to raise electric vehicles into the mainstream passenger vehicle market. But now is not the time for falcon doors or glitchy semi-autonomous systems or breathless hype about Bugatti-beating roadsters with rocket-tech boosters. Now is the time to show people that a simple, all-electric vehicle can slot seamlessly into their lives. On that front—especially coming from an established automaker—the Chevrolet Bolt is the among the best in the battery-powered business. So far. 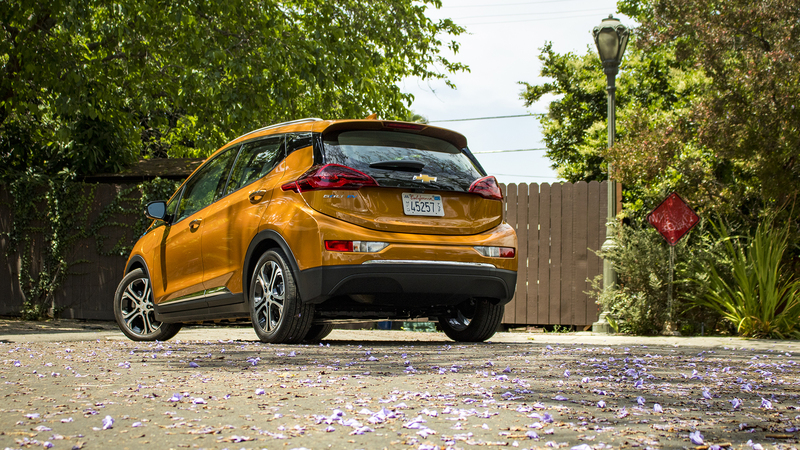 Inside and out, the Bolt offers up the same inoffensive styling that you expect from a mass-market GM car in 2018. (Again, that's not a veiled dig.) Tesla’s premium look comes at a premium price point, while the Bolt represents a humbler, more approachable path into the future. Its tall, narrow proportions border on egg-like from certain angles, but there’s very little to complain about in the minimalist body lines. That’s probably its biggest exterior strength: an untrained observer could mistake it for a next-generation Chevy Spark, the company's gas-powered misnomer of a subcompact. Given our generally low tolerance for radical change, it was smart for GM to keep the design language in the same universe as its regular cars. That said, I don’t think anyone who'd be interested in a Tesla would be swayed by anything described as “inoffensive,” and that word rings doubly true for the Bolt's so-so interior. 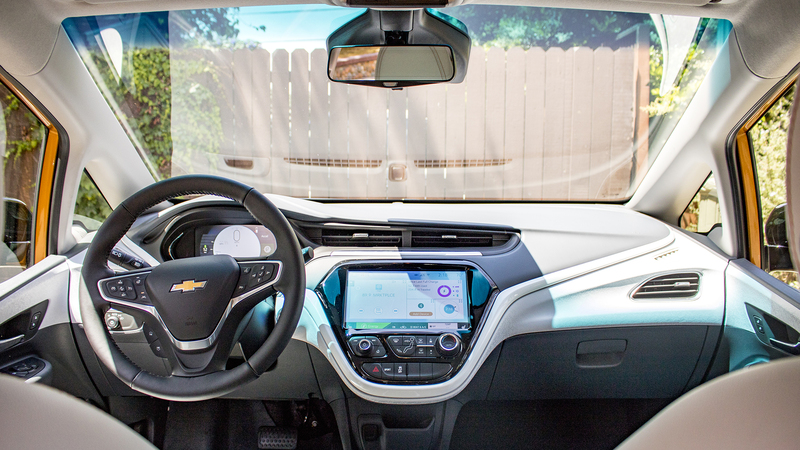 There are a lot of things to like—excellent forward visibility, a high seating position for easy ingress and egress, and a standard 10.2-inch touchscreen that runs a sleek version of Chevrolet’s MyLink infotainment operating system. The Premier model tosses in heated leather seats and steering wheel (the latter of which automatically activates below a certain temperature), plus driver aids like blind spot monitoring, rear cross-traffic alert, and a 360-degree camera. Further goodies like a seven-speaker Bose sound system, lane keep assist, and rear USB ports are available as standalone options or as part of a package. But overall, its comfort and convenience features are outclassed by a number of cars in the $30K-$35K range, not to mention the alternatives at the Bolt’s $44,000 price ceiling. Gripes small and large abound. The leather seats on the Premier model feel cheap and lack both power adjustments and lumbar support. Anyone over six feet tall will find their noggin jammed against the ceiling in the back, thanks to the floor-mounted battery pack. 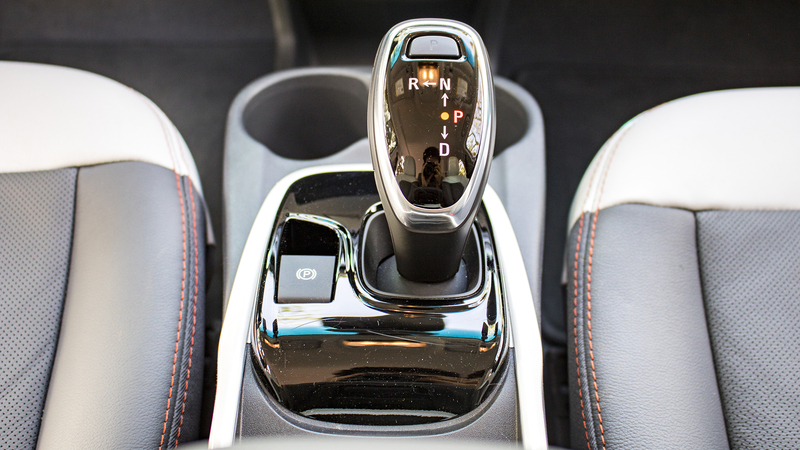 The poorly-designed shifter features a button to activate Park and a second button to deactivate it and move between drive modes. You’re surrounded by more plastic than a fish in the Great Pacific Garbage Patch. 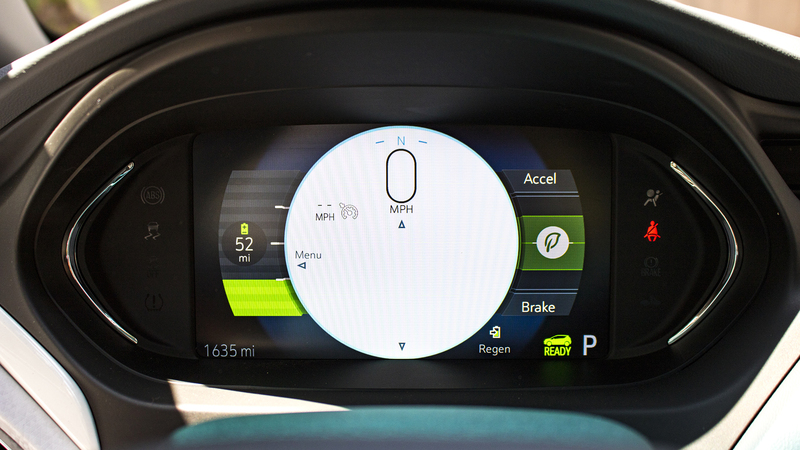 Maddeningly, even your top-of-the-line Bolt will still come with three blank buttons front and center on the dash, which GM says are a concession to foreign markets and as-yet-unannounced features in future versions. 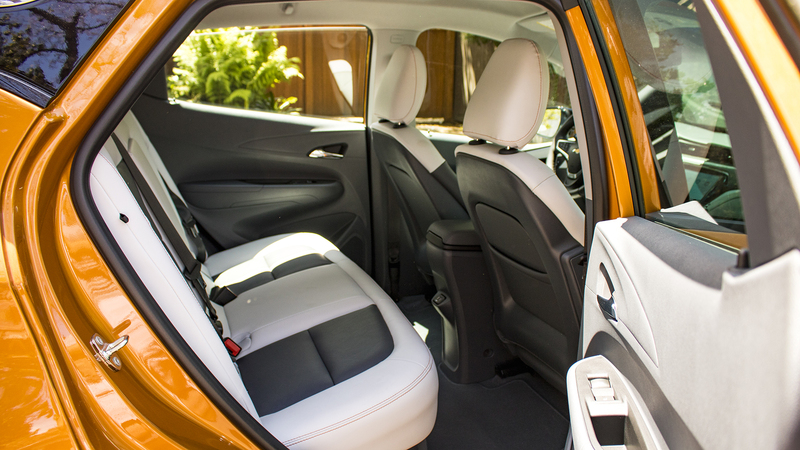 Still, past all those quibbles lies an interior suited to the crossover-hatchback chimera class, which means a good amount of usable cargo space with the seats down. Its 56.6 cubic feet trail some similar-sized vehicles, but the Bolt partly makes up for that with a flat floor behind the front seats and underfloor storage in the cargo area. 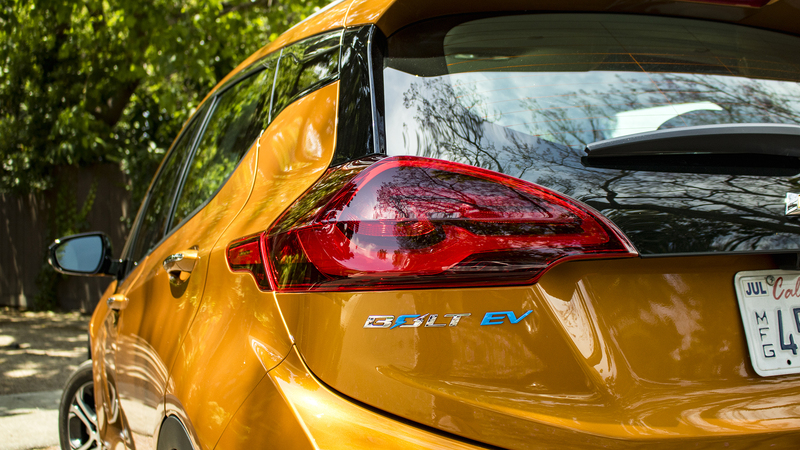 By far the biggest stumbling block to mass adoption of electric cars is the question of range, and the Bolt answers it with a bold claim of 238 miles of it. That’s a pretty solid number—less than the long-range Tesla Model 3, sure, but still more that the base Tesla and almost every other electric vehicle out there. Even the second-generation Nissan Leaf, coming into the market more than a year after the Bolt, only brings 150 miles to the table. 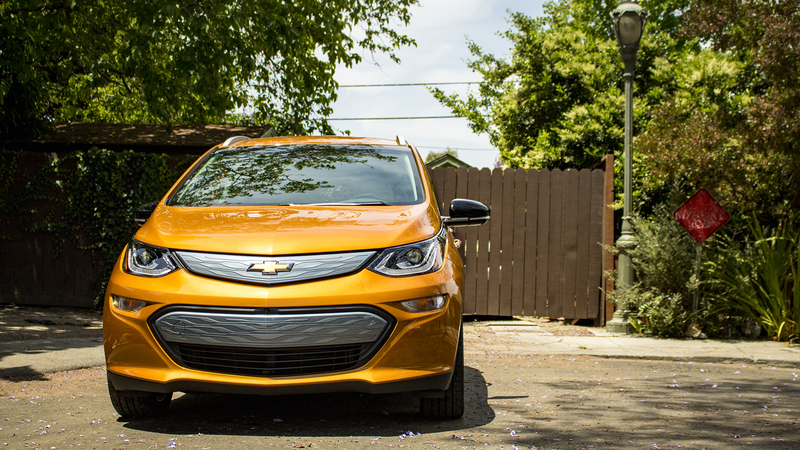 So 238 miles is great for EVs, but not so much compared to the Bolt's fossil-fueled brethren. That doesn’t mean it’s not workable for a vast swath of the population, given that many of us drive far less than that in a day and often return to the same place at night where the car can be charged. I live in an apartment with no way to run a power cord to my parking spot, so I actually fall outside that category—but since my tester was equipped with an optional $750 DC Combined Charging Systems fast-charging port, I was able to top up the battery halfway through my weeklong loan when I went to dinner at a restaurant that happened to have a charger in the parking garage. Fast chargers like that are becoming a relatively common sight nowadays in bigger cities—but less so in about 90 percent of the country. Tesla invested heavily in its Supercharger network to help bridge the gaps and make an electric road trip a real possibility, but no such infrastructure exists for the Bolt. On a household setup, 240 volts will charge the battery in 10 hours, while a regular old 110-volt plug needs 30 hours to get it done. Even that fast-charging port only gets you 90 miles of range in 30 minutes before defaulting to the slower charge speed. That really won’t matter around town, especially if you can plug it in at home at night. I didn’t run a full range test, but the burn rate I saw driving around Los Angeles was commensurate with the EPA's numbers, and other reviewers have found it can well exceed 240 miles if you nurse it and fully use the regenerative brakes. Still, if you like to take off for parts unknown at the drop of a hat, you’ll feel stymied by the limited charging opportunities out there. Anyone with a longer commute would have to decide for themselves whether the savings on gas were worth the limited margin for unplanned detours and the hassle of charging more often. It’s a tad mean to assume EV buyers automatically don’t care if their car drives well, but it’s also true that it probably wouldn’t matter if it didn’t. 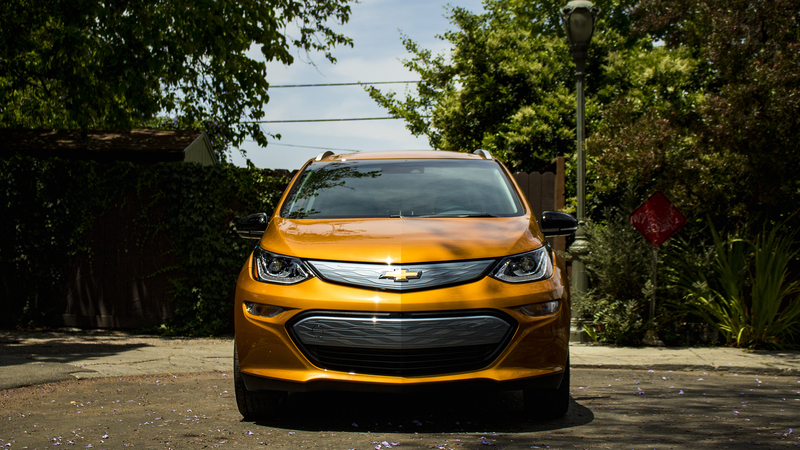 Thankfully, the Chevrolet Bolt a fun little electric go-kart of an eco-friendly ride. 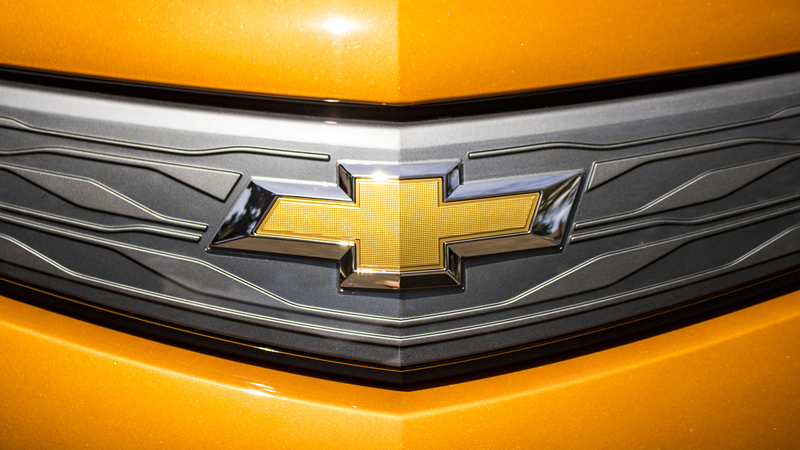 The steering is just average, but suspension is well dampened, and the acceleration is a hoot; this Chevy'll scoot from 0 to 60 miles per hour in 6.5 seconds, and the power is constant and direct. It loses steam past 80 and tops out at an artificially-limited 91 mph, but there’s always enough for a highway pass, and more than plenty for darting through traffic-clogged avenues. But it’s worth noting that if you’re into giving up control, the Bolt lacks the semi-autonomous systems available on Teslas and Nissan's Leaf. Adding to the fun is the unique regen braking setup General Motors uses. Instead of tying the system to the regular disc brakes, its engineers settled on two options: a special drive mode that enables “one pedal driving” by activating the regen braking as soon as you lift off the throttle, and a steering wheel paddle that gives you that power on demand, thus functionally doubling as a finger-operated brake. Mastering both modes proved to be quite satisfying. Less than satisfying are the 17-inch low-rolling-resistance Michelin tires, which don’t offer much grip and squeal like a piggy at the slightest push. When I told that to a friend who owns a Bolt with an upgraded set of shoes, he recommended we meet up in Malibu just after sunrise for a few canyon runs to see the car’s true character unleashed. It’s not surprising that steaming up a mountain full tilt will lower your range with a vengeance. What is surprising was that I hardly cared, since I was having a great time tossing it into the curves. The screaming tires and high seating position belie a planted road feel, kind of like one of those newfangled SUV coupes. Then we switched cars at the summit, and bounding down those switchbacks on grippier tires, it wasn’t hard to imagine myself in an electric hot hatch. Relying on the regen brakes also brought back more than half the angrily-expended range. 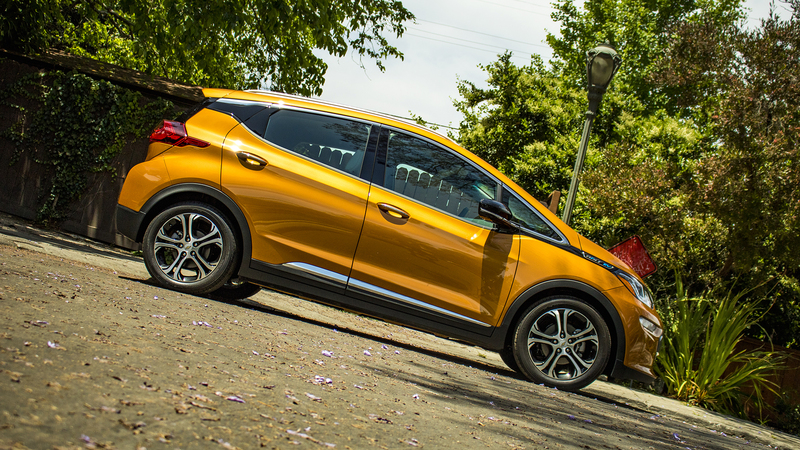 The 2018 Chevrolet Bolt is a wholly unremarkable car—and really, that just might be the most remarkable thing about it. After all, there’s no tank of fossil juice sloshing around in the back, no problematic emissions, and no engine noise. Yet there I was, driving around with everyone else in a little piece of the future. Actually, that’s not accurate. 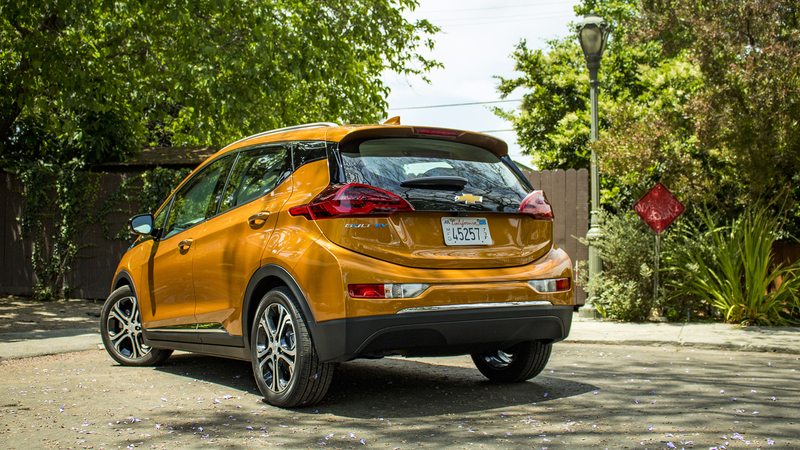 Unlike the still-forthcoming $35,000 Tesla Model 3, the Chevrolet Bolt is the present. It starts at $37,495 and maxes out at a bit more than $44,000, but the $7,500 federal tax credit and numerous state incentives will push the effective price well below those numbers. Whether we see it or not, this really is a watershed moment: the first normcore EV from a major manufacturer that offers decent range without a budget-busting price. As an electric vehicle, it’s among the best. As a regular car, it’s pretty okay. That may not get your juices flowing, but mass acceptance of electric vehicles needs more than flash. It needs stability, predictability, reliability...every calming and soothing automotive trait under the sun to convince regular people that this technology is worth a shot. So in many ways, “pretty okay” is just a few tweaks away from perfect.